DURING EXERCISE, ARMY PERSONNEL MOVE 800 PIECES OF CARGO ONTO A NEARBY MILITARY SHIP: JAXPORT is one of 17 U.S. Strategic Seaports on-call to move military cargo. JAXPORT is partnering with U.S. Army units for exercises expediting the movement of ocean-going military cargo. Construction of JAXPORT’s $30 million ICTF was funded through state and federal grants. JAXPORT’s ICTF allows cargo to move directly between ships and trains, speeding up the shipment process. The port of Jacksonville’s newly completed Intermodal Container Transfer Facility (ICTF) at Dames Point is being used in support of a high-level military training exercise this month in advance of its official opening to commercial container movements later this year. During the exercise, uniformed Army personnel are moving nearly 800 pieces of cargo—including vehicles, containers and equipment from the facility onto a nearby military ship. 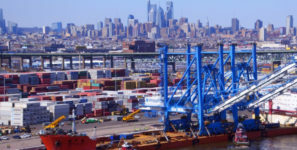 The ICTF allows cargo to move directly between ships and trains, speeding up the shipment process, extending the port’s intermodal reach well beyond Jacksonville and increasing the region’s global trade competitiveness.